This article by Jewel Fraser appeared in Caribbean Life News. Follow the link below for the complete original report. Dry conditions mean that he frequently faces bush fires, a challenge compounded by increasing climate variability that makes it difficult to predict when an extended dry season, and the fires that accompany it, are likely to occur. So in May, when the Trinidad and Tobago Meteorological Service (TTMS) began issuing weather bulletins specifically to keep farmers updated on expected weather conditions, he found a measure of relief. “Before, it was difficult when you were expecting to have rain and [instead] you were having drought…and bush fires,” Alexander told IPS. The 10-day bulletins for farmers that the TTMS issues have considerably reduced the uncertainty, he said. “Now we have updates, we can plan better, if we are having an extended dry season. So bush fires won’t affect us” as they did before, he said. Trinidad boasts some of the finest cocoa in the world and the makers of Cadbury chocolate once owned and operated a cocoa estate in the island. 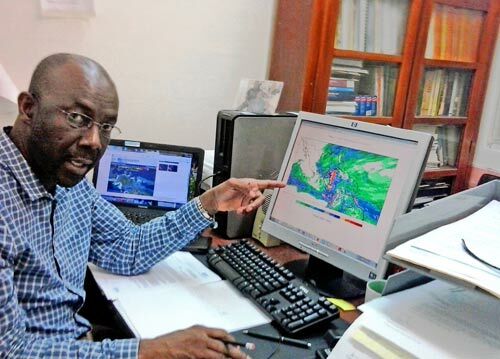 Kerr is one of two meteorologists in Trinidad and Tobago who produce 10-day forecasts geared specifically to the farming community. The other, Arlene Aaron-Morrison, is a trained agrometeorologist as well as a climatologist. The decision to provide climate forecasts specifically for farmers came out of a joint initiative launched in 2010 by the Caribbean Institute for Meteorology and Hydrology, the World Meteorological Organisation, the Caribbean Agricultural Research and Development Institute, and the National Meteorological and Hydrological Services of 10 Caribbean countries. This initiative is known as the Caribbean Agrometeorological Initiative (CAMI). CAMI’s website states that support for agriculture is a priority since the sector not only contributes to food security but also helps to reduce poverty and stimulate economic growth. CAMI acknowledges that, “The Caribbean region is vulnerable to a wide range of natural hazards, ranging from catastrophic events such as floods, droughts, and tropical cyclones to pests and diseases in plants, animals and humans. “Especially in poor rural areas, these disasters cause much suffering, infrastructure and environmental damage, aggravate food insecurity and slow down or even reverse development gains. “Climate variability, climate change and land degradation are intimately linked and are generating unexpected effects, e.g., an increased occurrence of extreme weather conditions in the Caribbean region,” states CAMI’s website. Against this background, a number of meteorologists around the region have been trained in agrometeorology. They now provide regular updates to farmers regarding the weather conditions expected in the days or month ahead. Kerr explained that the TTMS provides both a two to three-page Agromet Forecast and a four to five-page Agromet Bulletin. The forecast gives a 10-day prediction of rainfall and temperature for the north, south, east, west and central areas of Trinidad and for Tobago, with a brief summary at the end as to how these expected conditions will affect the work of farmers. The Agromet Bulletin discusses at length the preceding 10 days’ weather, as well as the next 10 days’ forecast. It includes data on wind speed and expected humidity. It also analyses in detail how farmers can best respond to the expected climate conditions. Both the forecast and the bulletin provide the forecasts in terms of percentage probability. “We are dealing with a science that has large uncertainties and 10 days ahead is very long in terms of how the atmosphere may or may not change. That is why we use probability,” Kerr said. The forecast and bulletin provide definitions of the terms used and of the likelihood associated with a particular percentage probability. A probability greater than 70 percent means there is a very good chance that the forecast will prove true. Such analysis on how farmers can work with the impending weather conditions is routinely provided in the Agromet Bulletins. The forecasts are done through computer modelling. “We use several models to look at what is happening and to see what is most likely to occur. Then using our subjective judgement based on our training and experience along with the climatology of the various locations, we arrive at a forecast for the different districts,” Kerr explained. The findings are supplied to farmers through e-mail, the media, and one-on-one, said Aaron-Morrison. The bulletin and forecast are also made available through agricultural extension offices and other agriculture-based organisations, including the Agricultural Society of Trinidad and Tobago, the Caribbean Agricultural Research and Development Institute and the Tobago House of Assembly.